For Wholesale/Trade shipping information, please log into your account for shipping information or visit our Wholesale information page to send us an enquiry. You will also be presented with the option to upgrade to Royal Mail 24 or Courier for an extra charge. Please note, this does not constitute an upgrade in your order processing time, just the delivery method once it leaves our warehouse. For orders delivered by Royal Mail, the shipping charges above apply, but courier service to these areas is charged at a higher rate. You will be shown the relevant courier charge while placing your order (once you have provided the postcode for your shipping address). We ship to all countries within the European Union using Royal Mail and the shipping charge is determined by the weight of your order. You can see what your shipping charge will be on the checkout page before you commit to placing the order, but you will need to register your details so that the website can calculate the postage accurately to your address. Click here to register an account now. Europe AirMail If your order is less than 2kg in weight (including packaging) you will be presented with World AirMail as an option on the checkout page. If you do not see this option, it is because the combined weight of your order comes to more than 2kg. Courier We do have discounted courier rates for many EU countries and if applicable, it will automatically appear in your postage options if you are logged in to your account. We use the Parcelforce European Courier service which usually takes two to four working days to reach most destinations. We ship to many countries worldwide, including Australia, New Zealand, Canada and the USA using our postal service, Royal Mail. The shipping charge is determined by the weight of your order. You can see what your shipping charge will be on the checkout page before you commit to placing the order, but you will need to register your details so that the website can calculate the postage accurately to your address. Click here to register an account now. World AirMail If your order is less than 2kg in weight (including packaging) you will be presented with World AirMail as an option on the checkout page. If you do not see this option, it is because the combined weight of your order comes to more than 2kg. Courier We use Parcelforce to ship to most worldwide destinations and you will see the cost of that in your postage options when you are logged into your account. Please note that there may be a surcharge for remote areas. If your order weighs more than 2kg, courier shipment will be the only option. The official line is that we aim to despatch orders within 3 to 5 working days of receipt, but between you and me, it's a matter of personal pride to try and pick, pack and ship your order within one working day. Orders are not processed or shipped on Saturday or Sunday or during UK Bank Holidays. Within the UK, your order should be delivered within two working days, or next day if you choose Royal Mail 24 or Courier at checkout. However, as we cannot guarantee when an order will arrive please consider any shipping or transit time offered to you by Chocolate Baroque or other parties only as an estimate. 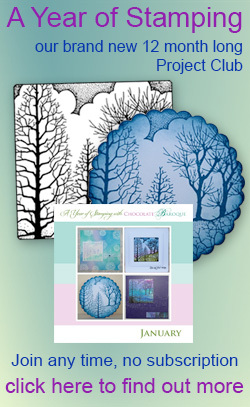 Note though that we cannot accept returns or offer refunds on printable or digital products. Fulfillment mistakes that we make resulting in the shipment of an incorrect product to you will also be accepted for return/exchange up to 15 days from the date of despatch. In this instance please notify us as soon as possible so that we may be given the opportunity to rectify the error. 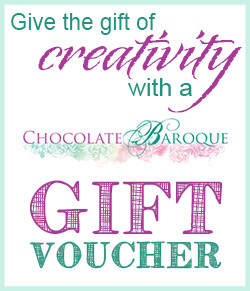 On those occasions where a product needs to be returned, Chocolate Baroque will refund any postage charges incurred. In the case of large/bulky items, we may arrange collection. If you change your mind, you can return any product within 30 days of the date of you receiving the goods, provided they are complete, undamaged and in their original packaging. We will not cover the cost of postage for returning items due to you changing your mind. Shipping surcharges may be applied to very bulky or heavy items. We will always tell you if there is a surcharge - any product to which this applies will state within its description the amount of the extra shipping cost. If at checkout you think you may have been overcharged on shipping, please re-read the product description before contacting us. If you have read all the way to the bottom, thank you for taking the time to read through everything here. If we haven't answered your question here, please check our Terms and Conditions page too or visit our Contact page to find out the best way to get in touch.